Bring Brewery Spiced Chicken Wings to the next tailgate and make some new friends! Dijon mustard and soy sauce liven up Brewery Spiced Chicken Wings. Mix first 4 ingredients; pour over chicken in shallow dish. Turn chicken over to evenly coat both sides of each wing. Refrigerate 30 min. to marinate. Heat grill to medium-high heat. Remove chicken from marinade; discard marinade. Grill chicken 15 min., turning occasionally. Brush lightly with barbecue sauce. Grill 5 min. or until chicken is done, turning and brushing frequently with remaining sauce. 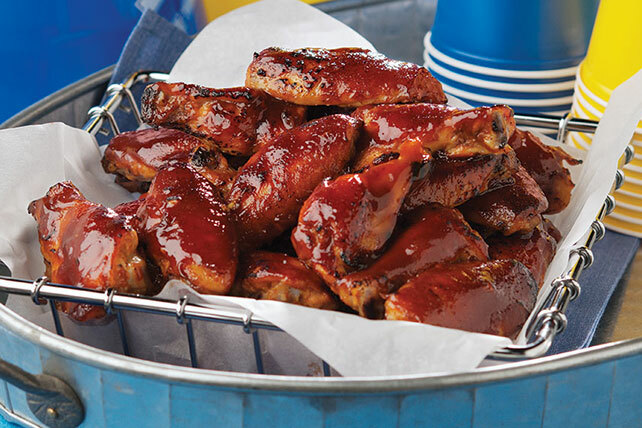 Savor the flavor of these spicy wings, but remember to keep tabs on portions. Sprinkle with 1 Tbsp. each toasted sesame seed and sliced green onions just before serving.